Ants, ants, ants, everywhere! Those pesky insects have a way of finding every little crack and opening right into your home. With Spring finally in full swing I have begun to see an ant scout here and there and I want to nip it in the bud before they take over my life! With kids and pets spending the majority of their day playing, crawling, and somersaulting (well the kids are somersaulting, not the dog) across the floor, I am not about to sprinkle a pesticide around my home that will put them in danger. Thankfully there are plenty of ways to get rid of ants without putting your family at risk. I have talked before about natural pest control but today I am going to focus specifically on getting rid of ants. Ant colonies will send out scouts to locate food sources. Those little bugs will zig and zag and probe their way until they find food, which they will bring back to their colony, leaving a trail of pheromones behind them. Other ants will follow the trail leaving their own pheromones making the trail stronger until all the little foragers are marching along, back and forth, taking all your goodies back to their home. Fascinating and annoying all at once. 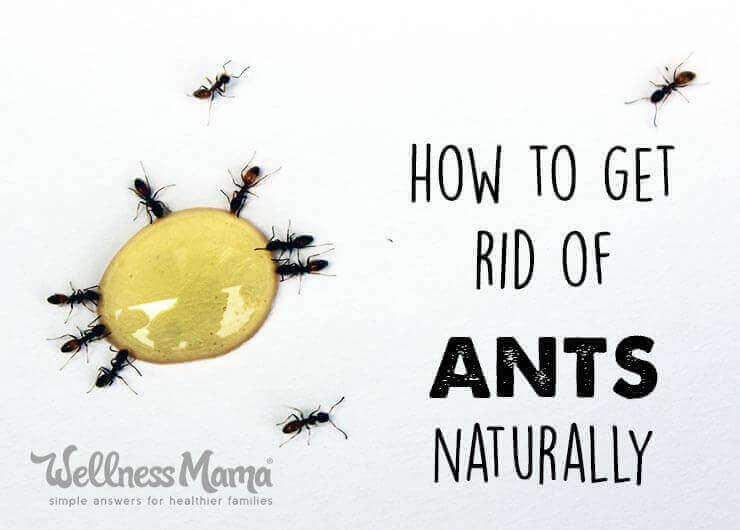 So what is the answer to naturally get rid of ants? There are several approaches you can take. Repel them from coming into your home in the first place, control and eradicate them once they are in, and finally, kill them at their source. The first step to get rid of ants is to make sure any sweet ingredients in your home are sealed tightly. Clean up the dribbles down the side of the honey jar and make sure your maple syrup lid is on tight. 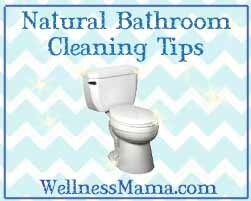 It is also recommended to keep floors swept and all counters free of any food or drips, but that is not usually practical or possible in a busy home like mine. Just do the best you can with this one. Create a barrier – Many people have good luck creating a barrier of something ants generally don’t like or won’t cross. Some examples would be drawing a chalk line or sprinkling cinnamon, cayenne pepper, baby powder, or coffee grounds along common entry points. Citrus Peels – Ants are also repelled by citrus. Oranges, lemons, grapefruits, etc. contain D-limonene and it is effective at killing ants. Save your orange or lemon peels and dry them out. Pulse them in a blender or food processor to make a powder and sprinkle this along entry points in your home. You can also sprinkle these around your garden. Essential Oils – I have had good results deterring ants that were determined to come in under my screen door with an essential oil spray. Fill a small spray bottle with water and add about 20 drops of peppermint oil. Shake well and spray along doorways and window sills. It repels the ants and covers the scent of any food and pheromones. 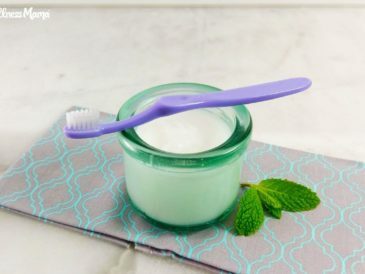 You can also put several drops of peppermint, orange, or lemon oil on a cotton ball and place it in cabinets to deter ants from snooping around in search of food. Vinegar – Spraying vinegar along doorways and window sills is another option. This has the same effect as the peppermint oil spray. Mix vinegar 50/50 with water in a spray bottle. Add peppermint oil or a citrus oil like orange or lemon to this mixture to make it even more effective. What if Ants Are Already In Your Home? The ants are already in. Now what? First, find out where they are coming in from and where they are going so that you can figure out the best way to tackle their removal. Something attracted them and that will need to be cleaned up. Then find their entry point so that you can use one of the tips from above. Once you have found point A and point B, move on to clean up. You will obviously need to remove the ants from your counter, floor, cabinet or wherever they are. 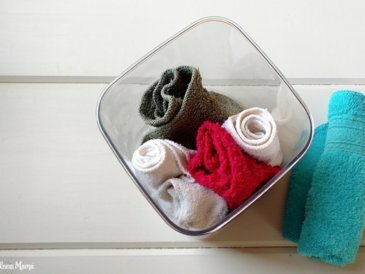 You can wipe them up with a cloth (or paper towel if you don’t want to try to remove them from your cloth). Now on to the important part. You have to remove the pheromone trail. You can use soapy water, a 50/50 water and vinegar mix, or the essential oil spray. If you don’t clean up the trail, other ants will be able to easily find the same food source. I don’t know about you, but my first instinct is to kill any bugs I see in my house (or call for my adventurous daughter to do it for me). However, this may not always be the most effective way to rid your home of ants in the long term. If you can resist the temptation to kill them immediately, you can make an ant poison they will take back to their colony and feed to all of their friends. It requires a little bit of patience but will pay off in the end. I learned this trick from Katie of Kitchen Stewardship on a podcast episode. 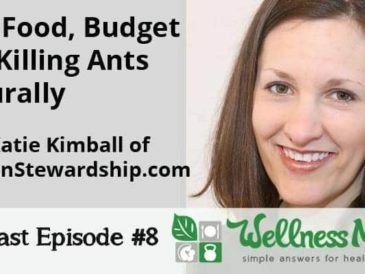 It does not immediately remove the ants from your kitchen (in fact it may seem like it attracts more at first, which is actually a good thing) but it works really well for the long term because it works to eliminate the colony and not just the ants entering your home. If you are uncomfortable with using Borax, you can try using baking soda. Mix equal parts baking soda and powdered sugar and place it in a lid near where you think the ants are coming in. The powdered sugar will attract them, but since they are unable to differentiate between the sugar and the baking soda, they will carry both back to their nest. When ants consume baking soda it reacts with the acidic substance in their bodies and is fatal to them. Again, not an immediate fix, but very beneficial in the long term. Ants, however, become dehydrated when they come into contact with DE because it damages their waxy coating which will kill them. They will not take it back to their colony but it will stop them from making any progress into your home. Sprinkle DE along doorways and window sills, and any other points of entry, in trash cans, and along cabinets and baseboards. I have also sprinkled it liberally on my carpet during a particularly bad ant invasion. After a few days the ants were gone and I just vacuumed up the DE. Use extreme care if you will be using this outside and avoid any areas that may have honey bees. The DE will stick to their legs and they will consume it when they are grooming. DE is sharp to small insects and will kill them. We want to kill the ants and fleas, but NOT the honey bees! castile soap will also compromise the waxy coating that protects the ants. Make a spray with 1 quart water and 1/4 cup liquid castile soap. Spray along doorways and window sills and anywhere else you see ants coming in. Repeat a couple of times a day until the problem is resolved. Dealing With More Than Ants? 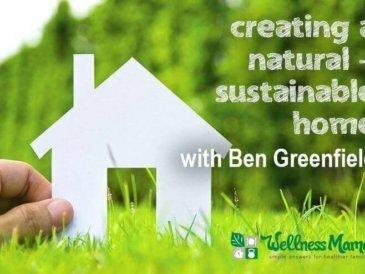 If you have other pests plaguing you there are other natural pest control options for your home and some organic ideas for your garden. How do you deal with ants? Did I miss any effective tips that have worked for you? 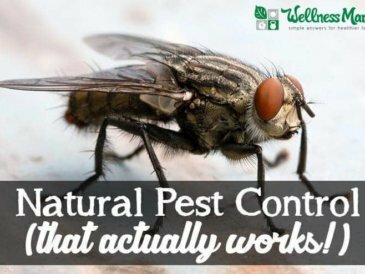 5 Natural Pest Control Options That Work!